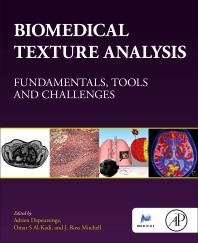 Biomedical Texture Analysis: Fundamentals, Applications, Tools and Challenges describes the fundamentals and applications of biomedical texture analysis (BTA) for precision medicine. It defines what biomedical textures (BTs) are and why they require specific image analysis design approaches when compared to more classical computer vision applications. The fundamental properties of BTs are given to highlight key aspects of texture operator design, providing a foundation for biomedical engineers to build the next generation of biomedical texture operators. Examples of novel texture operators are described and their ability to characterize BTs are demonstrated in a variety of applications in radiology and digital histopathology. Recent open-source software frameworks which enable the extraction, exploration and analysis of 2D and 3D texture-based imaging biomarkers are also presented. This book provides a thorough background on texture analysis for graduate students and biomedical engineers from both industry and academia who have basic image processing knowledge. Medical doctors and biologists with no background in image processing will also find available methods and software tools for analyzing textures in medical images. Adrien Depeursinge received a B.Sc. and M.Sc. degrees in electrical engineering from the Swiss Federal Institute of Technology (EPFL), Lausanne, Switzerland, in 2003 and 2005, respectively, with a specialization in signal and image processing. From 2006 to 2010, he performed his Ph.D. thesis on medical image analysis at the University Hospitals of Geneva (HUG). He then did a Postdoctoral Fellowship in the Department of Radiology at Stanford University. Starting from 2014, he holds a joint position as professor at the University of Applied Sciences Western Switzerland, Sierre (HES-SO) and as research associate in the Biomedical Imaging Group at EPFL. Dr. Depeursinge was the recipient of the 2011 German Association for Medical Informatics, Biometry and Epidemiology Award in medical informatics for his Ph.D. thesis. His research interests include N-dimensional texture analysis with control of image scales and directions as well as clinical workflows of image-based computer-aided diagnosis systems. University of Applied Sciences, Western Switzerland (HES-SO). Omar S Al-Kadi received the PhD in Biomedical Engineering from the University of Sussex (Brighton, UK) in 2010, and the MSc. and BSc. in Information Technology and Biomedical Engineering from the University of Canberra (Canberra, Australia) and Cairo University (Cairo, Egypt) in 2003 and 2001, respectively. In 2010 he joined King Abdullah II School for Information Technology at the University of Jordan (Amman, Jordan) as an Assistant Professor, and in 2011 he was a Visiting Researcher in the Center for Vision, Speech and Signal Processing at the University of Surrey (Guildford, UK). During the period from 2013 to 2015 he was a Research Fellow at the Institute of Biomedical Engineering at the University of Oxford (Oxford, UK), working on improving 3D Ultrasound-based drug delivery strategies for liver tumor analysis and segmentation. He was also a Visiting Professor at the Medical Image Processing lab within the Institute of BioEngineering at the Swiss Federal Institute of Technology - Lausanne (EPFL) from 2015-2016. Since 2015, he holds the position of Associate Professor at King Abdullah II School for Information Technology at the University of Jordan. His research interest include developing novel approaches in image processing and analysis, such as texture analysis, image classification and segmentation, with a particular interest in medical imaging.